Fiji’s Prime Minister and chair of the G77, Commodore Voreqe Bainimarama, has called on members of the developing world to focus on one important goal — that helping ordinary people see possibilities, seize opportunities, and creating new wealth and prosperity is at the root of what South-South cooperation is ultimately about. “Our collective agenda must seek to tackle the causes of poverty, exclusion and inequality, so that neither income, nor gender, nor disability, nor geography will exclude anyone from the benefits of development,” said the Prime Minister, adding that today’s technology must be accessible and affordable to everyone. Speaking in Hong Kong at a High Level South-South Forum on ICT and Sustainable Development, the Prime Minister said that South-South cooperation can be a powerful means to empower the people of the developing world. “South-South cooperation cannot be an abstract concept for relations among governments; it must be an avenue for reaching all of our peoples; and for us as nations to share information on technological advances that promote success and stimulate growth,” he continued. The Prime Minister told the Forum that it is a myth that the South must depend fully on developed countries for technology, because there is a great deal of innovation coming from the developing world. The Prime Minister pledged to the community of developing nations that they can count of Fiji to do its part. 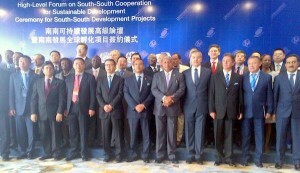 The Forum, attended by Excellency John Ashe, incoming President of the UN General Assembly; the Honorable CY Leung, Chief Executive of the Hong Kong Special Administrative Region; Ambassador Francis Lorenzo, President of the IOSSC; Mr. Hamadoun Touré, Secretary General of the International Telecommunication and high level international representatives from government and the private sector, was convened by the International Organization of South-South Cooperation (IOSSC) and brings together leaders from around the globe to discuss how South-South Cooperation can utilise and boost information communication technologies in the cause of sustainable development.